One cookie I make every year for Christmas is the classic Spritz cookie. 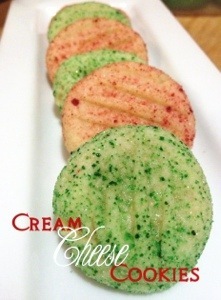 This year I saw on Pinterest a recipe for Cream Cheese cookies that were said to be Spritz like. Of course since I misplaced my cookie press, I had to give these new cookies a try. After tasting several samples I can report that these are definitely in the Spritz family of cookies. They are creamier but still have that same taste if that makes sense. My niece thought they tasted like sugar cookies, only better. In a large bowl, cream butter using a mixer. Add in cream cheese and sugar. Beat to mix thoroughly. Add in egg yolk and vanilla and beat together. Gradually add in flour and mix together. Add about 1/4 sugar to a small bowl. Add food coloring gel of your choice and mix together until sugar turns to your desired color choice. Using a tablespoon, scoop dough and form into a ball. Dip in the sugar to completely coat. Place on cookie sheet them flatten with a fork. Bake for 9-11 minutes or until lightly brown on bottom. Cookies should be soft not crispy.